1. 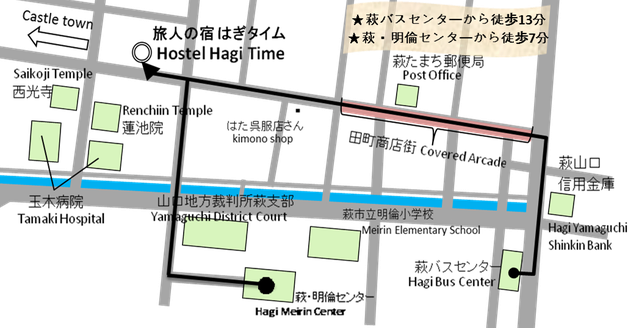 When you get off the bus、you can find Fudabaato intersection on the north side of the bus center and in front of Hagi Yamaguchi Shinkin Bank. 2. After passing the intersection, there is a shopping arcade on your left side. 3. Pass through the arcade and then go straight the same street. 4. You can find our hostel on the right side. The hostel is two stories white building and next to the Shimose Photo Studio. 5. If you lost the way, please call us or ask the local people (People in Hagi are very kind! ).